The Society of St. Pius X (SSPX) is what I have always called "pseudo-Traditionalist." By recognizing Ratzinger as pope, but refusing to submit, they set themselves up in a strange situation where they decide what to obey from the Vatican, and what they will not obey. This is totally un-Catholic and leads logically to the sell-out to Ratzinger expected by the end of the month. Their General Superior, Bishop Bernard Fellay, is ready to hand over the SSPX to Ratzinger, Judas-style. The other three bishops (Tisser, Galeretta, Williamson), have balked. Now what? Some observations made by Traditionalist Bishop Sanborn : The Society of Saint Pius X does not offer a Catholic solution, since on the one hand they recognize Benedict XVI as a true Catholic pope, but on the other hand they completely ignore him. In this they are like the Jansenists, Gallicans, Feeneyites and other sects who have acted similarly. If Benedict XVI is the Pope, then he must be obeyed. His teachings and his disciplines must be accepted. It is hypocritical to accept his authority but to obey him in virtually nothing. The only Catholic solution is to reject Vatican I I and its changes as contrary to the previous teaching of the Catholic Church, and to reject as non-Catholic and as non-popes those who have given us these poisonous changes. Only in this way does the Catholic preserve both the indefectibility of the Catholic Church and the identity of faith, discipline, and worship with its glorious past. 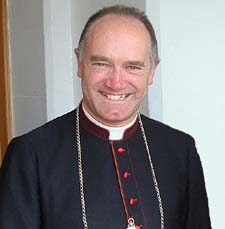 The only Catholic solution to the intruding heretic who has penetrated into an apparent position of authority is to declare him anathema Having failed to do so, the SSPX will sooner or later have to give in to the man they claim is pope. How can it remain in limbo forever? Their whole reason to exist is to have a seat in Ratzinger's Frankenchurch--a one world religion of abomination---as long as they can interpret Vatican II in the "light of Tradition." Alas, no amount of light can help one to see heresy as Truth. You're spiritually blind. And the SSPX will soon find themselves with the last vestiges of Catholicism destroyed and their Rites made invalid, as new "bishops" of the Vatican II sect start to "ordain" their "priests" and consecrate new "bishops"--just like what happened in 2002 with the sell-out in Campos. Unless they recognize the empty chair of Peter, they will soon have an empty tabernacle, and join with Ratzinger on the road to perdition full speed ahead. Concise and "al punto" [to the point]; as they say in Italian...Thank you for this needed light in the SSPX "outer darkness..."